Product prices and availability are accurate as of 2019-04-21 06:14:42 UTC and are subject to change. Any price and availability information displayed on http://www.amazon.com/ at the time of purchase will apply to the purchase of this product. Think out of the box with our dashing selection of cufflinks featuring designs that are a bit out of the ordinary. This handsome pair of cufflinks, each embellished with three blue rectangles, comes packaged in an attractive personalized silver-tone case. 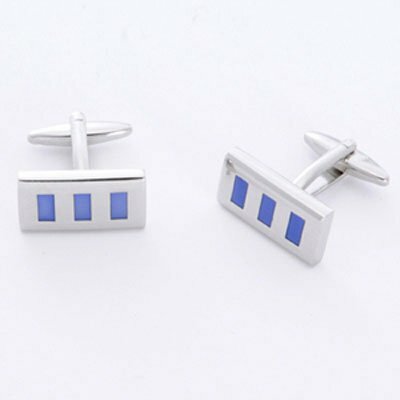 These cufflinks make perfect groomsmen gifts and add a little pizzazz to any wedding attire. Light-weight plated polymer case measures 3"x 1 1/8"1 1/2"and is lined in black satin. Personalize the case with two lines of up to 15 characters per line.